This doll is from Krasnokamsk (near Perm) in Russia, east of Moscow. A friend in Poland originally found her first dolls like this a long time ago in their monthly fleamarket. And in those there was a paper that she could read. These dolls were purchased in Poland. The largest doll is painted in an unusual orange scarf which seems to be unfinished (not outlined). 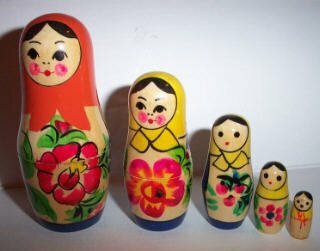 Some other examples of this type of doll in a friend’s collection also have unfinished scarves like this, but others are outlined like the smaller dolls.